We can also have a economical solutions of Refurbished Yamaha High Speed Pick and Place Machine, The origin of these machines are Japan. These are well maintained and fully Refurbished Machine. 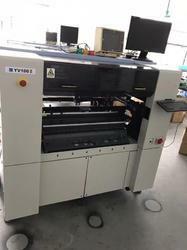 This Machine is suitable for 1200mm PCB Handling Capabilities with all kind of LED Board, Driver Cards, Mobile Charger, FM USB, DTH, Setup Box etc... We have a full technical support on these machine also have a many Installation base over the India. We have in house Running Demo and Training centre in our Delhi Office to provide the operation, programming and Maintenance training to our New or Existing Customers to know more about SMT Machines to get more trouble Free Production thru this way…. SumiLax SMT have Head office in New Delhi – India and Branch Office in India - Haridwar, Mumbai, Bangalore and Gujarat.. Looking for Refurbished SMT Pick & Place Machine manufacturer ?